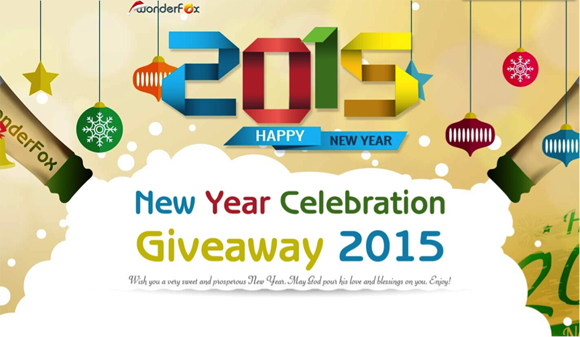 WonderFox 2015 New Year Celebration Giveaway: 1000 free copies of license keys per day! You are here: Home / Software / WonderFox 2015 New Year Celebration Giveaway: 1000 free copies of license keys per day! The Christmas holidays are passed now. Many of you may have collected a lot of recorded video clips with Smartphone or digital cameras. It’s time to gather all the materials and turn them into memories to remember the good times of Christmas. It’s so good to share the pleasure with your family and friends. On this occasion, WonderFox Soft (www.videoconverterfactory.com) starts to offer the best solution for all TechPraveen readers to stay away from the troublesome issues of video conversion & editing. Before January 31st, 1000 free copies per day of HD Video Converter Factory Pro license key are offered in the New Year Celebration Giveaway. What’s more, WonderFox DVD Ripper Pro is also included in this event, to bring you the fastest way to backup DVD collections you’ve got throughout the whole year. What are you waiting for? Grab this chance now before the giveaway event reaches its deadline. Enjoy it! HD Video Converter Factory Pro is equipped with advanced High-Definition (HD) video conversion technology. It can help users convert videos between Standard-Definition (SD) and High-Definition (HD), even 4K standard. HD Video Converter Factory Pro also enables users to compress video file to cut down the file size. 1. Convert any videos between Standard-Definition (SD) and High-Definition (HD), even 4K standard. 2. Optimize video with the newest encoder H265 (HEVC) and VP9. 3. Video compressor – Full control to cut down the video size with the minimum quality loss. 4. Online HD video downloader. 5. Support 150+ video formats and the latest devices. 6. 30x real time video converting speed. It provides the quick conversion for AVI, MP4, MKV, MOV and M4V in between. WonderFox DVD Ripper Pro provides the best solution to convert your personal DVD collections to a wide range of mainstream video formats and latest devices. In supports of all regular DVDs including DVD Movie, TV Show, Tutorial (P90x and T25), etc. With the powerful DVD decryption technology, it can remove/bypass DVD CSS, Region Code, Disney X-Project and even Cinavia. How to get it free? Click on the button “Get It for FREE” to download it. Unzip the downloaded file. You will find the installer and license key in it. Install to your PC and register with the license key you’ve got.